Buddhism was imported to Japan via China and Korea in form of a present from the friendly Korean kingdom of Kudara (Paikche) in the 6th century. While Buddhism was welcomed by the ruling nobles as Japan's new state religion, it did not initially spread among the common people due to its complex theories. 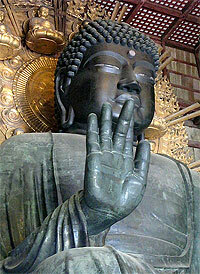 Of the main branches of Buddhism, it is the Mahayana or "Greater Vehicle" Buddhism which found its way to Japan. There were also a few initial conflicts with Shinto, Japan's native religion, but the two religions were soon able to co-exist harmonically and even complemented each other. During the Nara period, the great Buddhist monasteries in the capital Nara, such as the Todaiji, gained strong political influence and were one of the reasons for the government to move the capital to Nagaoka in 784 and then to Kyoto in 794. Nevertheless, the problem of politically ambitious and militant monasteries remained a main issue for the governments over many centuries of Japanese history. In 1175, the Jodo sect (Pure Land sect) was founded by Honen. 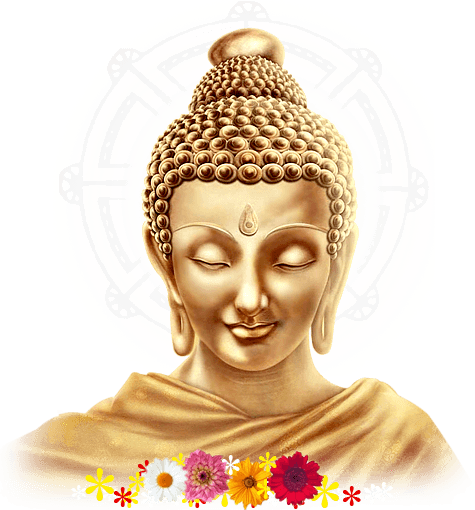 It found followers among all different social classes since its theories were simple and based on the principle that everybody can achieve salvation by strongly believing in the Buddha Amida. In 1224, the Jodo-Shinshu (True Pure Land sect) was founded by Honen's successor Shinran. The Jodo sects continue to have millions of followers today. In 1191, the Zen sect was introduced from China. Its complicated theories were popular particularly among the members of the military class. According to Zen teachings, one can achieve self enlightenment through meditation and discipline. At present, Zen seems to enjoy a greater popularity overseas than within Japan. The Lotus Hokke or Nichiren sect, was founded by Nichiren in 1253. The sect was exceptional due to its intolerant stance towards other Buddhist sects. Nichiren Buddhism still has many millions of followers today, and several "new religions" are based on Nichiren's teachings. Oda Nobunaga and Toyotomi Hideyoshi fought the militant Buddhist monasteries (especially the Jodo sects) thoroughly in the end of the 16th century and practically extinguished Buddhist activities on the political sector. Buddhist institutions were once more attacked in the early years of the Meiji period, when the new Meiji government favored Shinto as the new state religion and tried to separate and emancipate it from Buddhism. Nowadays about 90 million people consider themselves Buddhists in Japan. However, the religion does not directly affect the everyday life of the average Japanese very strongly. Funerals are usually carried out in a Buddhist way, and many households keep a small house altar in order to pay respect to their ancestors. Buddhist temples in Japan are varied, yet there are certain generalizations that can be made, and general rules or guidelines that are followed. Along with Shinto shrines, Buddhist temples are the most numerous, famous, and important religious buildings in Japan. The Japanese word for a Buddhist temple is "tera", and the same kanji also has the pronunciation "ji", so temple names often end with -ji or -dera. There are a number of other variations such as -in. Famous temples in Japan including Enryaku-ji, Kiyomizu-dera, and Kotoku-in illustrate the naming patterns. Buddhist temple complexes consist of a number of structures arranged according to certain concepts or guidelines. The Hōryū-ji in Nara, which claims to include the world's oldest wooden buildings, serves as a perfect example of the standard layout of a Buddhist temple/monastery complex. 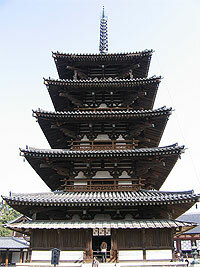 There are three essential buildings in any temple complex: a pagoda, typically three or five stories), a Great Hall (often called kondō) or honden, and a monastic study hall kodo. The arrangement of the major buildings (garan haichi) changed over time. An early pattern had a gate, tower, kondo and kodo in a straight line from south to north. Corridors extended east and west from the flanks of the gate, then turned north, and finally joined north of the kodo, forming a cloister around the pagoda and the major halls. This pattern, typified by Shitennō-ji in Osaka, came from China via Baekje; the Chinese style of Buddhist temples, though altered somewhat by China via Korean peninsula, ultimately was based on that of Chinese palaces, and this is evident in many of the basic design features which remain today in the temples of all three countries. A Buddhist temple complex in Japan generally follows the pattern of a series of sacred spaces encircling a courtyard, and entered via a set of gates. These gates will typically have a pair of large guardian statues, called Nio. In addition, many of the more important or powerful temples are built in locations which are favorable according to Chinese geomancy (Feng Shui). The arrangements of mountains and other geographic features in particular directions around the temple play important roles as well. Buddhist temples, like any other religious structures, need to be organized in order to best serve their various purposes. The most primary space in any Buddhist temple complex is the sacred space, where images of Buddhas and bodhisattvas are kept, and where important rituals are performed. This area is always separated off from the areas accessible to the lay worshippers, though the distance between the two and the manner of their separation is quite varied. In many temples, there is little more than a wooden railing dividing the sacred space with that of the laypeople; but in many others, there is a significant distance, perhaps a gravelled courtyard, between the two.